A cold front has begun pushing its way into North Texas, bringing with it cooler temperatures and a slight chance for rain. While we hit 100 on Saturday, we won't be able to get near that on Sunday. For those hoping to break or tie a record, that's bad news. Saturday's high brought the Metroplex within one day of tying the all-time record for number of days in a summer with temperatures over 100 at 69. With the cold front, it's unlikely we'll have another day in triple-digits this year -- meaning we'll have to be satisfied with a second-place finish at 68 days. Anyhow, about that cold front. 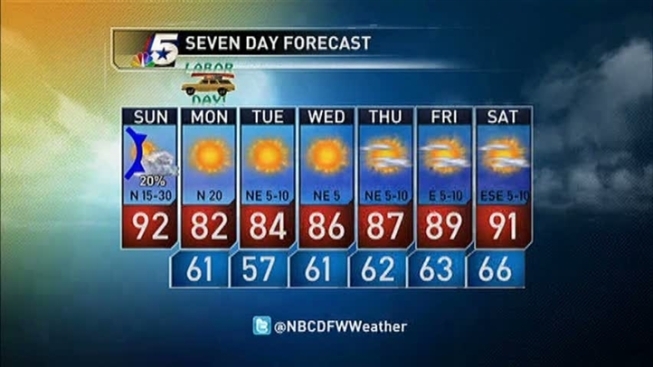 Rain chances are low with the cold front, between 10 and 20 percent, but a stray shower is possible, NBC 5's Remeisha Shade said Sunday morning. With the front pushing in, wind will really pick up out of the north and begin to cool things off. The wind will be between 15-30 mph with gusts up to 40 mph. The bad news is that the wind will also increase the fire danger Sunday and Monday. A red flag warning has been posted for Ellis, Hill, Navarro, Bosque and Hamilton counties -- and for most counties south of those counties. A high of 92 is expected on Sunday afternoon, but things will start really cooling down after that. By Monday morning, expect temperatures to be in the 60s with a high of 82 later in the day, Shade said. By Tuesday morning, temperatures are expected to drop into the high 50s. By next Saturday, temperatures will have slowly risen back into the low 90s. The cold front pushing through the state has also eased the strain on the Texas power grid, which has been excessively taxed during the lengthy period of extreme heat. Theresa Gage is a spokeswoman for the Electric Reliability Council of Texas, which manages the grid, said "we're out of the woods" if the lower temperatures hold. The state's electric grid operator took numerous steps to avoid rolling blackouts this summer, including calling on Texans to conserve power. Gage says "it took us all to get through this difficult summer."